US, 1956, 106 minutes, Colour. 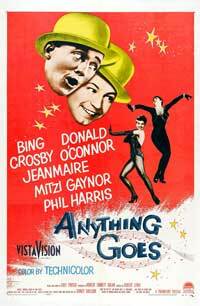 Bing Crosby, Donald O' Connor, Zizi Jeanmaire, Mitzi Gaynor, Phil Harris, Kurt Kasznar. Anything Goes is a typical musical comedy of the '50s. It is glossily produced. It was written by Sidney Sheldon, adapting the play by Guy Bolton and P. G. Wodehouse (which had been revised by the prize-winning team of Howard Lindsay and Russell Crouse). Words and music were by Cole Porter, although some additional songs by Sammy Cahn and James van Heusen were added. The film had the Paramount production values. Choreography was by French Roland Petit and American Nick Castle. Bing Crosby is at his usual relaxed best in the film - even taking some jokes about ageing. Donald O' Connor is bright (but appeared to better advantage in Singin' In The Rain and There's No Business Like Show Business). Mitzi Gaynor is a vital singing and dancing star. French Zizi Jeanmaire (who had guested in Hans Christian Andersen) is a skilful dancer. 1. An entertaining musical comedy? Show business story? Obvious and pleasantly predictable? 2. Production values: colour photography, stage and choreography techniques? The music, the dancing, editing? 3. Cole Porter's popular songs and witty lyrics? The additional songs? The opening with You Gotta Give People Jokes (not as successful as Porter's 'Be a Clown' or Donald O'Connor's 'Make 'Em Laugh' from Singin' In The Rain)? 4. The predictable plot: the ageing singing star, the young dancing star, their rivalries? The booking of two leads for their musical? Shipboard complications? Falling in love? The resolution for both women to be in the show? Audiences enjoying this predictable plot? 5. Bing Crosby's Bill Benson - his songs and ballads, his ego, his meeting Patsy and her father, his falling in love with Gaby, her thinking him a double-dealer, the strategies with Ted, the happy ending? Enjoyment of the Bing Crosby screen presence? 6. Donald O'Connor and his bright and breezy style, the fans chasing him, his ego, the meeting with Gaby? Falling in love with Patsy, being hurt by her change of heart? Resolution of the problems? His dancing skill? 7. Patsy and Mitzi Gaynor's lively presence, ballads, songs and dances? Falling in love with Ted? The problem of her father and his arrest? Change of heart, happy resolution? 8. Gaby and Zizi Jeanmaire's dancing skills? Ballet? In love with Bill? Hurt, overhearing Patsy and her father? The happy resolution? 9. Steve Blair and his financial deals, decision to return to America, supporting his daughter, the agents following him? 10. The world of agents, dancers? rehearsals? 11. Cole Porter's humour? The enliven of the show by the songs and dances: The 'show must go on'?